Presenting itself as the ‘USA leading custom thesis service’, this writing company offers the unique opportunity to get a draft prior to ordering an entire paper. Knowing this, are you interested to find out what else the company has to offer and what they managed to achieve since the establishment in 1998? We have discovered some interesting information while evaluating the service, which is why you should take a look at our Laustan.com review to get an insight. This company delivers every type of academic paper, but from what we could see on the website, their main focus is set on theses and dissertations. Even the list of services consists of thesis and thesis chapters, dissertation and dissertation chapters, research proposal and ‘any other assignment writing’. To check out the quality of papers, we ordered exactly this type of service – a dissertation chapter of average standard, ordered within a deadline of one week. What we got was an on-time delivery and what seems like an excellent draft from the writer we picked. However, the entire chapter’s quality was far from what the writer did in the draft, which made us very disappointed with the service. After all, the whole point of paying an extra $4.99 for the draft was to check the quality of the paper. The customer support service at Laustan works very well and has provided us with assistance during and after the delivery of the paper. The live chat agent was more than happy to send the paperback for a revision, after which we got an improved paper that somehow came closer to the average quality level. We could not find a price list on the official website, but you can check the quote on their free calculator. Our paper cost $22.25 per page, with an added discount. This is an affordable rate for a deadline of 7 days and paper for a Ph.D. academic level. With the added discount, it makes for a solid choice of a writing company. However, if you want to check the writer’s expertise as we did, be prepared to pay an extra $4.99. In our case, this was not really an indicator of the quality of the entire order. Unfortunately, we found no information on discounts or loyalty programs. You can only see the discounted price in the calculator and this discount is lower than 10%! As we could notice, there is no discount for bulk orders if you select more pages, nor there is a first-order discount mentioned. What we got was an automatically calculated discount of approximately 5%, which is too low for first order. Additionally, the fact that the company has no loyalty program for returning customers is a huge disadvantage. According to the website info, the company does have a newsletter in which they send special offers once you sign up. 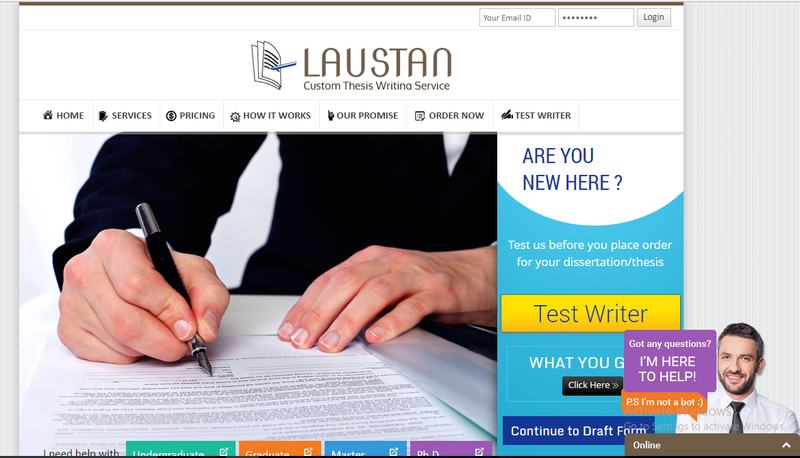 The website of Laustan.com is easy to navigate. It is simply designed and contains only the most necessary information, except for the discounts. We found the design to be inviting, but the lack of a blog or more information on the company and services to be concerning, especially since this company has been established over two decades ago. In conclusion, laustan.com is a legit writing service that has been on the market since 1998. However, even though the company is one of the oldest writing services on the Web, they still have some serious disadvantages in terms of discounts, quality of the paper and even website content.